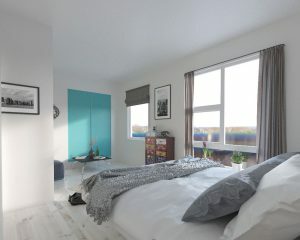 The McAvoy Group, one of the UK’s leading offsite construction specialists, has announced its expansion into the residential sector with the launch of a new modular solution for all housing tenures – affordable homes, market sale, build-to-rent, student accommodation, and emergency housing. Following extensive product development and collaboration with Queen’s University Belfast, McAvoy has developed a steel-framed offsite housing solution for multi-storey apartments, detached, semi-detached and terraced family homes. An entire house can be assembled in a single day – and from foundations to occupation in just seven days. According to a report published by Shelter, we need to build 250,000 new homes a year in the UK to keep up with demand – and yet only 163,000 new homes were delivered in 2017. There is a severe shortage of affordable homes and homelessness continues to increase year on year. There is a lack of skilled labour in construction, compounded by Brexit, and the building industry has a poor delivery record. In response, the Government has set a target to build 300,000 new homes annually by the mid 2020s and has pledged its support to increase the use of offsite construction. The McAvoy approach to housing will reduce programme times by at least 50 per cent compared to site-based construction. This will allow earlier occupation for public sector housing providers and generate a faster return on investment for private developers. It will use highly efficient and proven factory processes to deliver greater certainty of completion on time, on budget and to higher quality standards. BOPAS accreditation for reduced risk, and the assurance of durability for a 60-year design life to ensure mortgageability. McAvoy will work as principal contractor on its housing projects – taking responsibility for design, manufacture, fitting out, installation and external works. This will mean easier procurement, fewer management resources, greater cost efficiency, and improved quality control for developers and housing providers. For further information, visit www.mcavoygroup.com/sectors/housing, call 028 8774 0372 or email info@mcavoygroup.com.